It’s another one of those slow days here at Civil War Memory, but I didn’t want Robert E. Lee’s birthday to pass without showing due respect. With that in mind I thought we would once again try our hands at giving this print a caption. This is a truly bizarre print. I assume that in addition to Lee and Longstreet we are looking at John Bell Hood and A.P.Hill. It looks like Hill’s horse is eating blood-stained grass. What’s Lee complaining about? Even Traveller looks upset with Longstreet. I will leave the rest to you. OK Ken, what do you got for us? And if you are looking for something to listen to this Saturday evening, here is a nice discussion between Peter Carmichael, Allen Guelzo, and James McPherson. Now, that being the official caption, let’s go over what may be going on in the picture. I think Hill is three seconds away from falling off his horse because of his venereal disease, Hood really, really, REALLY doesn’t want to attack the Round Tops, Longstreet is fascinated with his hat, and Lee is getting ready for the greatest ‘pull my finger’ joke in American history. Traveller is begging Longstreet not to fall for it. And, you claim to be objective, Kevin? You deceive yourself in your so-called objectivity. You also prove a horrible historian, Sir. Where have I ever claimed to be objective? I assume this means that you don’t want to play. Best I could do, sorry. Glad to see that you are able to join in on the fun. 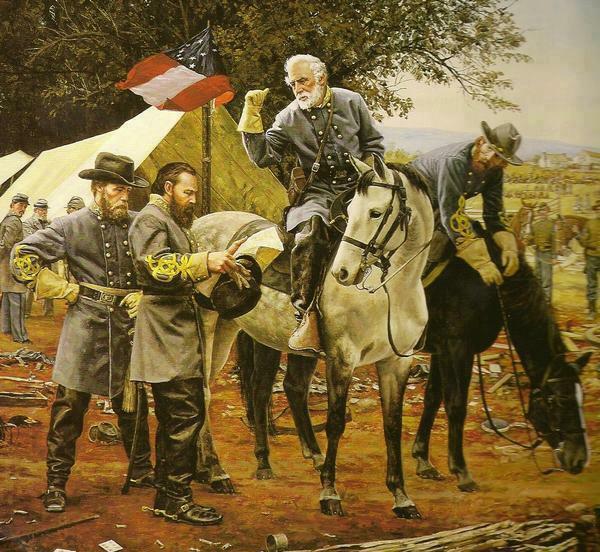 Interesting comment given the criticism Longstreet received by the Lost Causers. I told you two we are now wearing grey hats like Hood…black is so last year.